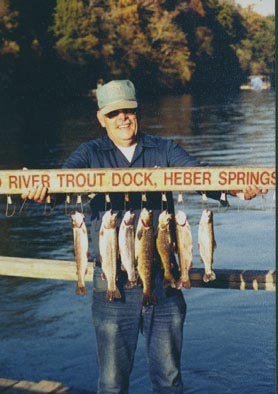 Red River Trout Dock is a trout fishing resort located on the Little Red River near Heber Springs, Arkansas. We are a full service resort offering cabin rentals, RV camping, full service fishing dock, and fishing guide service. Our goal is to help you have an enjoyable time during your visit. We are open year round except at Christmas. Stay in our modern cabins. Both one and two bedrooms are available, or bring your RV and stay in comfort on our campground. Our fishing dock is located near where the world record brown trout was caught in 1992 (weighing 40 pounds, 4 ounces). Let our experienced fishing guides introduce you to trout fishing on the Little Red. Some of the fishing dock services include boat and motor rentals, bait, tackle, and license sales.